Drivers also get an efficient 1.4 L ECOTEC turbocharged MFI engine that puts the fun back in the Lakeland commute and wins rave reviews from the experts. Find your favorite here then, keep reading to see why for all things Chevrolet we are your one-stop shop. Affordable Financing: Explore your perfect payment options, research rebates and incentives, calculate your monthly costs, value your trade, and apply for financing right from your computer. Commercial Sales: If you’re looking for something rugged and roomy for your Lakeland business we’ve got you covered. Parts and Accessories: Whether it’s parts for that project at home or accessories to trick out your new Chevrolet vehicle, our comprehensive inventory and budget-friendly prices can get you what you need. 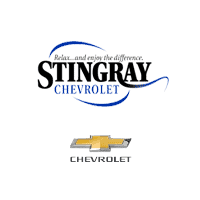 From the moment you enter our showroom, the staff Stingray Chevrolet is here to make sure every aspect of owning your vehicle is convenient and affordable. Contact us today to see how.